Iceland became the smallest nation to progress to a World Cup after beating Kosovo to win their qualifying group for Russia 2018. The Euro 2016 quarter-finalists, who knocked out England in the last 16, have a population of about 335,000. They are the only country to qualify for a World Cup with a population of fewer than one million. Everton's Gylfi Sigurdsson and Burnley's Johann Gudmundsson got the goals on Monday evening. Sigurdsson settled his side's nerves with a neat finish just before half-time then turned provider for Gudmundsson to ensure victory with a close-range strike. 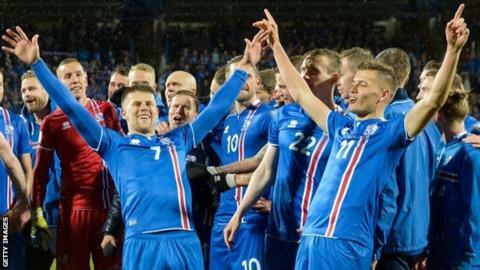 Iceland have won seven of their 10 Group I games in World Cup qualifying. Iceland coach Heimir Hallgrimsson, a part-time dentist, had been concerned his players would struggle to motivate themselves for another qualifying campaign after their exploits at Euro 2016 in France. "The first beer after a party is not the best," he said. "The hardest thing was to get going again after our massive party in France. "The success is not an end in itself but a long journey towards a final destination." Captain Aron Gunnarsson of Cardiff City and his team joined in with the crowd's now-famous Viking clap to salute victory. Kosovo manager Albert Bunjaki said Iceland's success is an inspiration for all small nations. "Congratulations to the whole Iceland team," said Bunjaki, whose country's population is about six times larger than Iceland's. "It's a great example for small nations like our own who aim to have a good team, well organised, in the future." Have England improved since 2014 World Cup? Read more on World Cup 2018: Have England improved since the 2014 World Cup?